Many people request metal-free restorations because they match in color and blend into surrounding teeth appearing more natural and aesthetically appealing. Thanks to recent advances in cosmetic dentistry, you no longer have to worry about exposing a mouth full of silver colored amalgam when you talk or smile. 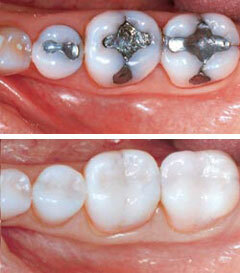 Metal-free crowns, bridges, and fillings are just as strong and effective as their earlier metal counterparts. In most cases, it is difficult to tell that a tooth has been restored with a composite resin restoration. The tooth-colored materials that we use for restorative and cosmetic dentistry at our practice are durable and long-lasting and have been selected for their proven strength and increased aesthetic capabilities.